A Dossier forms the basis of creating a story: it is used for gathering all files that are related to the story and it contains tools to publish a story to an output channel such as the Web or Adobe DPS. This article describes how to work with Dossiers in Content Station 9. In a typical workflow, a Dossier is created by converting a Dossier template into a new Dossier. Dossier templates are set up by the system administrator and contain all necessary files and settings for creating a story to one or more publications. Example: A Dossier template for a news event can be set up with Publication Channels for publishing the story to the printed newspaper, the Web, Facebook and Twitter. For each Publication Channel, articles containing formatting styles are available for use in each Publication Channel. Other files such as a layout template and a Task can also be available. For a detailed description, see Working with Dossier templates in Content Station 9. This is the most basic method of creating a Dossier and can be used for creating a story from scratch. In the Applications pane on the Home screen, double-click the New Dossier icon. Figure: The New Dossier icon on the Home screen. In the Planning Application, select an Issue in the Issue pane and click the Dossier button in the toolbar. 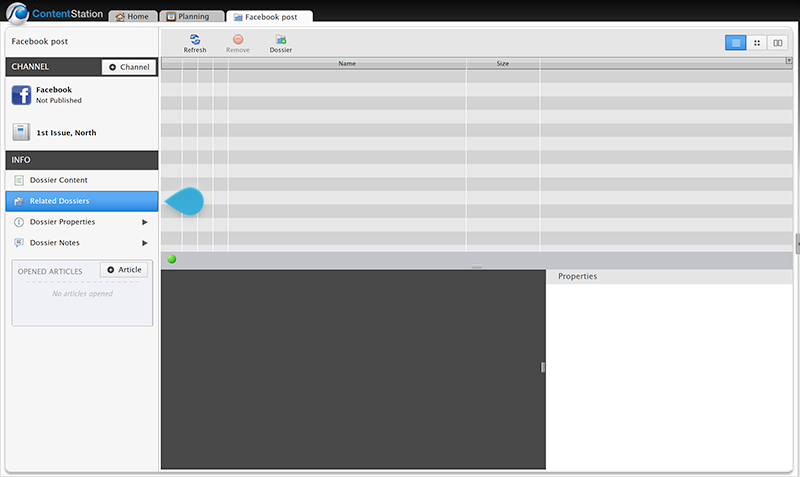 Figure: An Issue selected in the Issue pane (A) and the Dossier button in the toolbar (B). 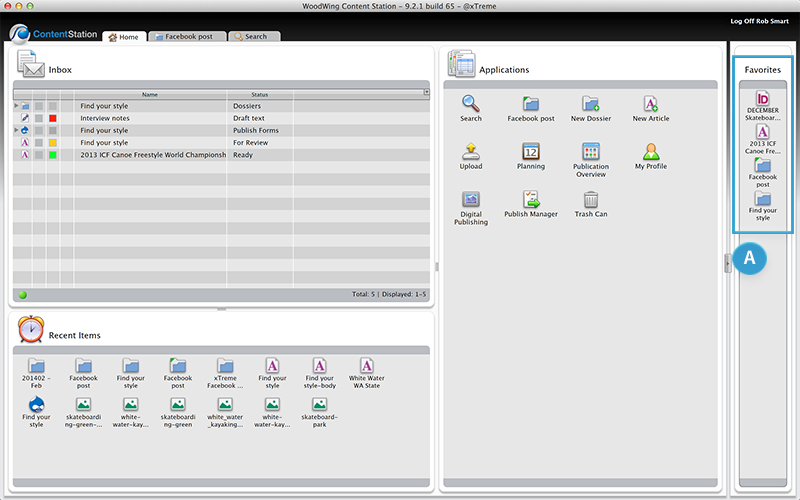 In the Applications pane on the Home screen of Content Station, double-click the Planning icon. Step 3. (Optional) Set the Brand, Issue and Category as well as any of the other properties. Note: When creating the Dossier by using the Planning Application, the Dossier will inherit the properties of the targeted issue and normally don't have to be changed. The Dossier is created and is opened in a new tab. A logical next step is to add files to the Dossier. The process of creating a story can also begin by finding one or more files that you subsequently want to bundle in a Dossier. Note: Make sure not to select a Dossier, Dossier template or Publish Form; these files cannot be added to a Dossier this way. Step 3. Enter a name for the Dossier. Step 4. (Optional) Set the Brand, Issue and Category as well as any of the other properties. The Dossier is created and all selected files are added to it. The Dossier is opened in a new tab. The process of adding a file to a Dossier does not mean that the file is physically moved. Instead, a reference to the file that is stored in the system is created. This means that all instances of the file are one and the same file: making a change in one instance of the file will be visible in all instances of that file. Files can belong to multiple Dossiers. Sometimes, the files that you want to add to a Dossier are already part of another Dossier. Instead of adding each individual file to the Dossier, you can simply add the Dossier itself. In another scenario you may want to create a new Dossier from the files that you see in an existing Dossier. The newly created Dossier will automatically be added to the Dossier from which it was created. Note: A Dossier that is part of another Dossier is referred to as a 'Related Dossier'. Related Dossiers can be viewed by selecting Related Dossiers in the Info pane of a Dossier. 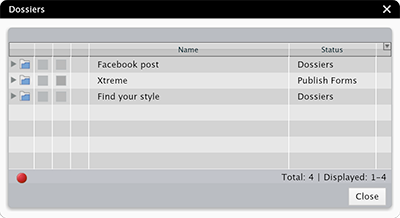 Figure: Here, a Dossier named 'Find your style' is added as a Related Dossier to the Dossier named 'Facebook Post'. Similar to creating a regular Dossier, you can create a Related Dossier from scratch (containing no files) or create a Related Dossier that already contains files. Step 1. Open the Dossier in which you want to create a Related Dossier. Step 2a. In the Info pane, select Related Dossiers. Figure: The Related Dossier option in a Dossier. Step 2c. Enter a name for the Dossier. Step 2d. (Optional) Set the Brand, Issue and Category as well as any of the other properties. Note: The Dossier will inherit the properties of the Dossier in which it was created and normally these properties don't have to be changed. The Dossier is created and is added to the list of Related Dossiers. In this method, files are selected in the currently opened Dossier and automatically added to the newly created Dossier. Step 2a. In the Info pane, select Dossier Content to view all files that are part of the Dossier. Step 2b. Select one or more files. Step 2d. Enter a name for the Dossier. Step 2e. (Optional) Set the Brand, Issue and Category as well as any of the other properties. The Dossier is created and all selected files are added to it. The Dossier is opened in a new tab. In the Dossier that was initially opened, the newly created Dossier is added to the list of Related Dossiers. Step 2a. 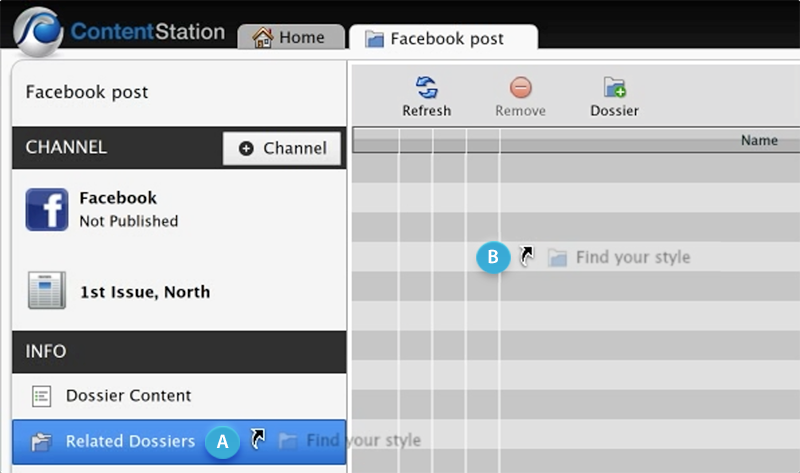 Locate the Dossier that you want to add anywhere in Content Station. Figure: Dropping a Dossier into the Related Dossiers option in the Info pane of a Dossier (A), or in the Document pane (B) when Related Dossiers is selected. Tip: In case you have navigated outside of the opened Dossier, return to the Dossier by first dragging and holding the mouse pointer over the Dossier tab. This will bring up the Dossier page again. Figure: Dragging a Dossier from the Home pane onto the tab of the Dossier in which it needs to be added. 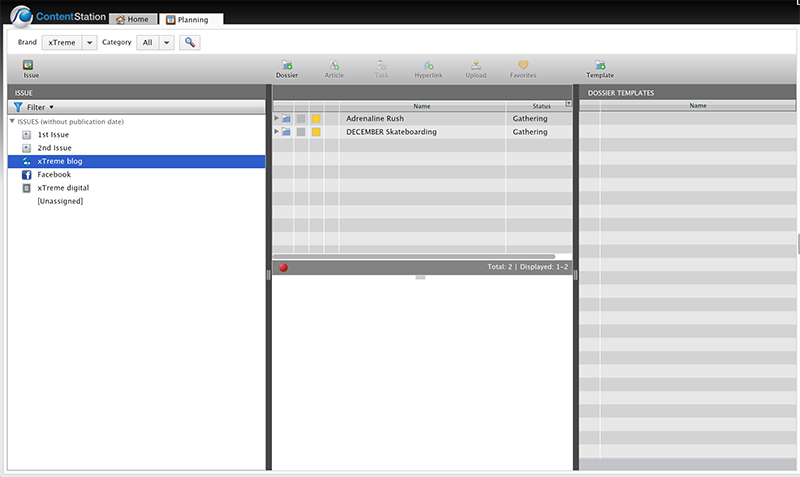 The Dossier window appears in which all Dossiers are shown in which the file is added. From here you can perform all regular actions: open the Dossier by double-clicking it, right-clicking the Dossier to access the context menu, and so on. Note: When the file is added to more than 3 Dossiers, you are asked if you are sure to open that many Dossiers. This is done because opening a large number of Dossiers containing a large number of files can potentially take a long time. Note: The process of adding a file to a Dossier does not mean that the file is physically moved. Instead, a reference to the file that is stored in the system is created. This means that all instances of the file are one and the same file: making a change in one instance of the file will be visible in all instances of that file. Figure: Different areas where a file can be dropped on to add it to a Dossier: (A) the Dossier Content option in the Info pane of an opened Dossier, (B) the Document pane of the Dossier Content option of an opened Dossier, and (C) a Dossier icon anywhere in Content Station (here in the Favorites pane). The Upload option is used for adding external files that are not yet stored in Enterprise. Example: Files that are saved on your local system, on a network server, and so on. 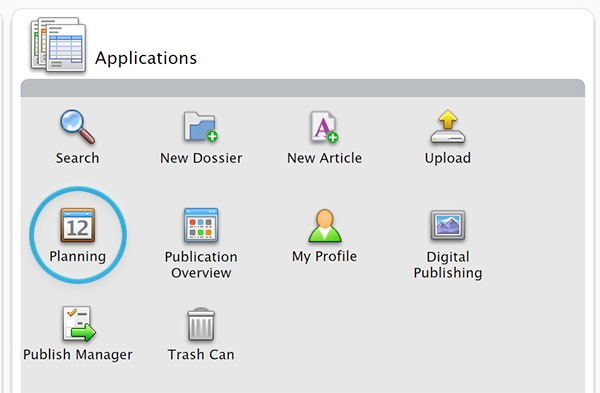 Click the Upload icon in the toolbar of the Dossier, select the files that you want to upload and click Open. Open the Dossier and in the Info pane select Dossier Content. 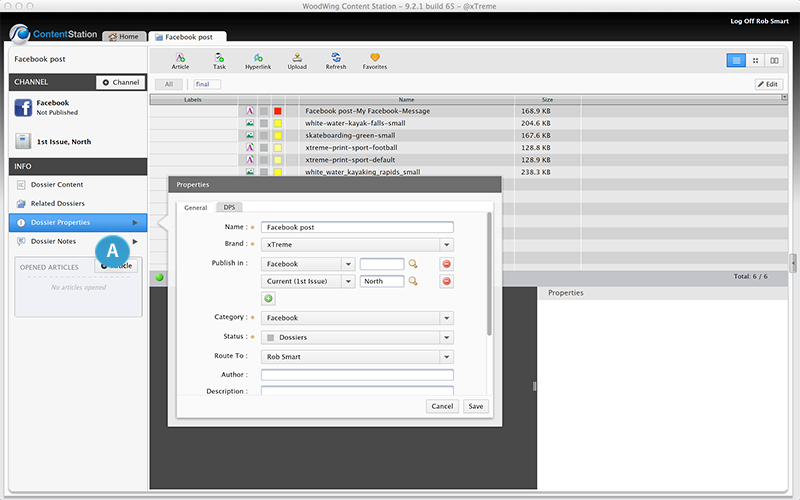 Figure: The Dossier Content option in the Info pane (A) and the Upload icon in the toolbar (B). Example: Drop a file that is saved to your Desktop onto the Dossier. The files all need to be of the same type: all images, all spreadsheets, all ZIP files, and so on. When uploading from Content Station Web, choose a file with a size that is less than 100 MB. The files need to be in a supported file format. The Upload dialog box appears. The files that are ready to be uploaded are shown on the left. Tip: Add additional files by clicking the '+' button or by dropping the files onto the dialog box. The properties are inherited from the Dossier into which the files are added. Step 2. (Optional) Change the properties as needed. The files are stored in Enterprise and added to the Dossier. When using this method, the file is only removed from the Dossier; it is not removed from Enterprise itself. Step 1. Open the Dossier from which the file needs to be removed. Right-click a file and choose Remove from Dossier. The file is removed from the Dossier. When using this method, the file is removed from the Dossier and moved to the Trash Can, ready to be removed from Enterprise altogether. Right-click a file and choose Move to Trash Can. The file is moved to the Trash Can. When working on files in a Dossier, more often than not you only need to see the files that you want to work on; all other files are superfluous and might get in the way of quickly finding the files that you are after. By filtering the files in the Dossier on only those that are relevant to what you need at that time, finding files and working on them becomes more efficient. This is done by assigning one or more Dossier Labels to a file in a Dossier and to subsequently filter the content of the Dossier to show only those files that have particular Dossier Labels assigned. Figure: A Dossier containing 12 files with several Dossier Labels assigned to each file. The Dossier is not filtered: all 12 files are shown. Figure: The same Dossier as in the figure above, but now filtered by Dossier Label 'photo shoot 1'. A total of 5 files are shown. 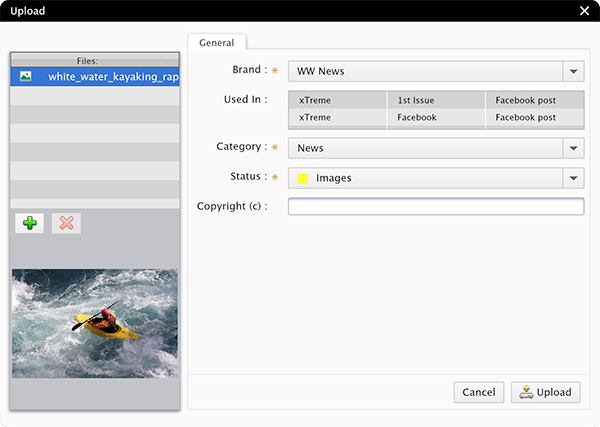 For more information about using Dossier Labels, see Filtering the content of a Dossier in Content Station using Dossier Labels. Step 1. Access the Planning Application. In the Applications pane on the Home Page, double-click the Planning Application. Figure: The Planning Application on the Home page of Content Station. In the Dossier pane, drag a Dossier to an Issue in the Issue pane. The Dossier will be removed from the current Issue and added to the new Issue. Perform the same action as above, but while holding the Option key (Mac OS) or Alt key (Windows). Instead of moving the Dossier, it is now copied to the new Issue. Drag a Dossier onto the [Unassigned] Issue. All assigned Issues will be removed from the Dossier. The second main purpose of a Dossier — the first being the ability to bundle content — is to easily publish a story to one or more publications. To facilitate this, multiple Publication Channels can be assigned to a Dossier, one for each channel that the story needs to be published to. Examples: Supported Publication Channels include print, Adobe DPS as well as Web-based channels such as Facebook, Drupal 7 or Drupal 8 and WordPress. Unpublishing content is easily done by clicking the Unpublish button. Print channels. These are not published from Content Station but are typically exported to PDF from InDesign or InDesign Server. Adobe DPS. Individual stories can be published from a Dossier but a more typical workflow is to make use of the Digital Publishing Application of Content Station. Working on a story is a team effort. To share a Dossier with other users you can route it to them. This will add the Dossier to their Inbox in Content Station and Smart Connection, and will send out an e-mail to notify them that a Dossier has been sent. In an opened Dossier, select Dossier Properties in the Info pane. Figure: Clicking Dossier Properties in the Info pane (A) displays the Properties dialog box for that Dossier. Step 2. 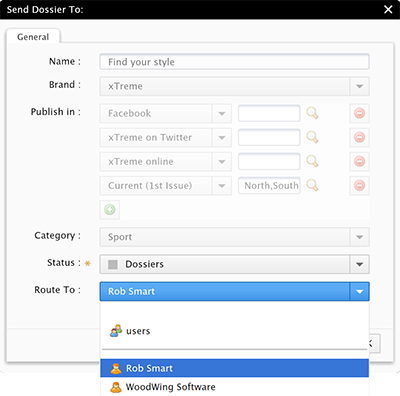 In the dialog box that appears, choose the user or user group to send the Dossier to from the Route To list. The Dossier is sent to the selected user or user group. Files and Dossiers that you use on a regular basis can be added to the Favorites pane for easy access. Figure: The Favorites pane (A). 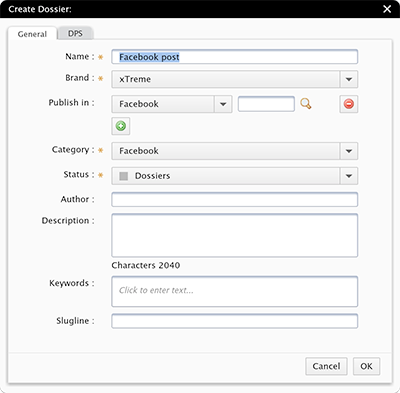 Drag a Dossier from anywhere in Content Station to the Favorites pane. 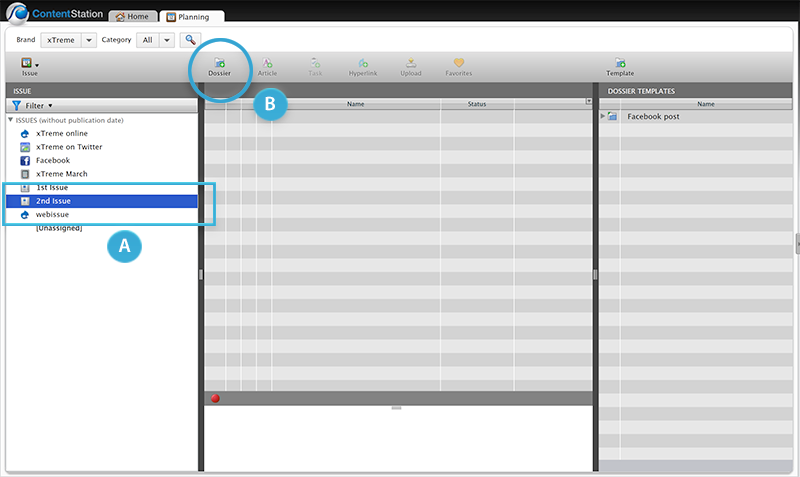 Figure: The Dossier Content option in the Info pane (A) and the Favorites icon in the toolbar (B). 4 September 2017: Updated section 'Opening all Dossiers to which a file belongs' with information about using Alt+double-click on a layout in the Publication Overview to open all Dossiers that the layout belongs to.